I just downloaded this extension today and found it’s really cool… As the title says, with Tab Mix Plus you can do many things with your tab. You can change the way your tabs work. Such as, you can choose to put close icon on each of your tabs. 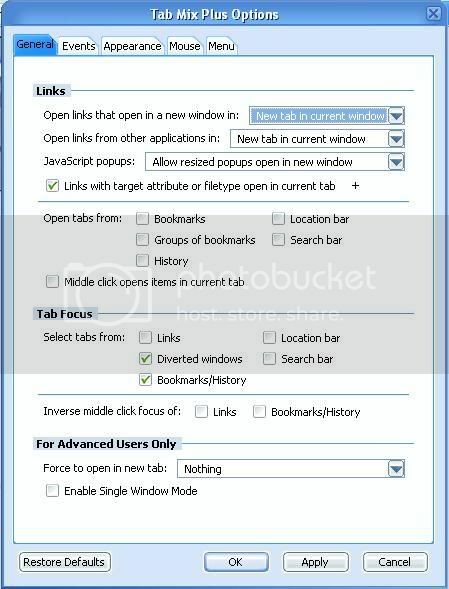 So you don’t need to right click and choose close tab each time you want to close the tabs. And if you click a link on any sites while you’re browsing, the link will be opened in new tab although it has been set to open in new window. Beside than that, each tabs will show progress of the sites that you open. So, you will know the progress of the site when it’s load. And it also will show you with red text title if the tab is not read yet. Actually there are many other features but I don’t have time to try it all. So, if you want to test and use it, check out the official site or click the download link below to download the lastest version.